Friday, October 30th at 7 pm: Goodbye Blue Monday, 1087 Broadway in the Bushwick neighborhood of Brooklyn: to get there, take the JMZ trains to Myrtle Ave or the J to Kosciusko St, walk a few blocks to the corner of Dodworth St & Broadway, and take a plunge. 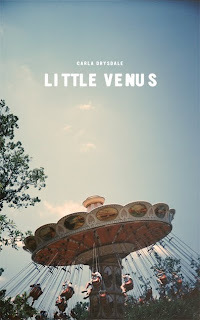 Carla Drysdale’s poems in Little Venus challenge the reader, tackling the hard subjects of child abuse, sexual exploitation and the failure of some families. The character of Little Venus runs through the poems burning with rage and want in an incendiary chant that the reader can’t ignore. Little Venus is a haunting collection that will stay with readers long after the last page is turned. Carla Drysdale was born in London, Ontario and was educated at Ryerson university in Toronto as well as Sarah Lawrence College in New York. Her poems have appeared in Canadian and US journals, including the Literary Review of Canada, Canadian Literature, The Fiddlehead, Global City Review, Confrontation, and LIT. She lives in Geneva, Switzerland, with her husband and two sons.